New Physics from " Creaktiv Systems "
This review first appeared in the September 2007 issue of fairaudio.de and can be read in its original German version here. It is herewith translated and presented to an English-only audience through a mutual syndication arrangement with fairaudio.de whereby they will translate and publish select reviews of ours while we reciprocate with one or two of theirs each month. As is customary for our own reviews, the writer's signature at review's end auto-links to his e-mail should you have questions or feedback you wish to send. All images contained in this review are the property of fairaudio.de - Ed. Fortunes smiled on me indeed and the concrete tiles crushed the Eso footers (and they see duty even today). Needless to say, I didn't pass up the opportunity to inform the dealer point for point on how my solution beat his. His placid protest of creating a "resonance jam" was parried and annihilated with my "yeah, but it works for me". How sweet vengeance can be. Today, I view hifi tweaks with less rancor. Some work, others don't. And that's all she said. Plus, different turns for different tunes. The audio interface is far too complex to allow predictive diagnostics. Borrow and listen -- that shouldn't be a problem most of the time -- and then acquire. Or not. If the tweak tanks, at least you've spent a few hours with your system. That's a good thing. This by way of segueing into luxo fuses and a line filter from Berlin's HiFi Tuning firm: Ultimate pure silver component fuses; Ultimate pure silver power distribution fuses (for your home's fuse box); and a Noise Destroyer. wire an additional outlet into the Noise Destroyer. Replacing the fuse on the audiolab 8000cd meanwhile was child's play and readily accessible. 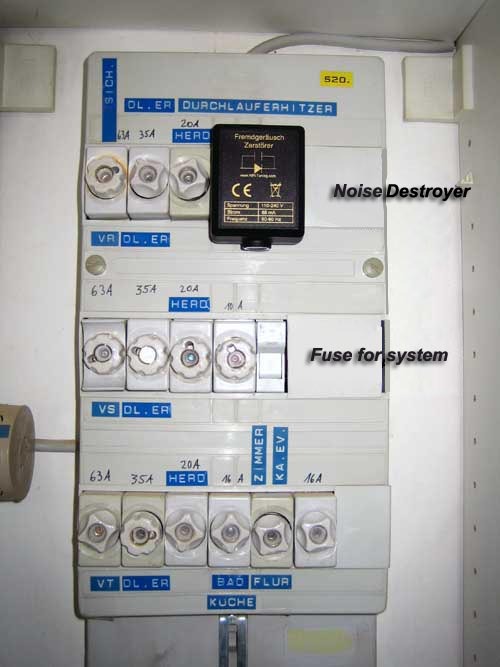 (Why five fuses is another subject.) 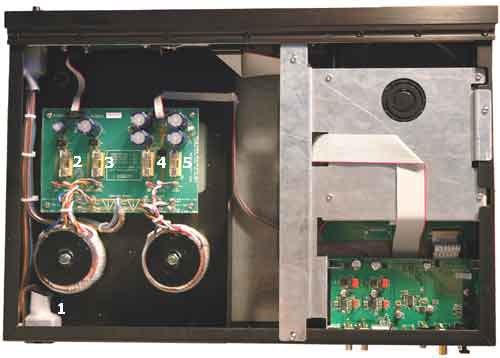 Dussun's integrated involved some sleuthing to find the darn thing while the pro roots of Benchmark's DAC-1 meant external fuse bay integrated with the IEC power inlet, fuse values kindly silk-screened on the enclosure. Yeah! While I couldn't buy the whole theory on fuse audibility, I now could clap my actual ears on perhaps a handful of nuances. Nuances? Wrong, my whole system sounded better, faster and more accurate across the line. Forget isolated qualities as beneficiaries such as much improved dynamics but everything else untouched. Shockingly, all aspects took the same small forward step which added up to an appreciable advance. True, dynamics gained and transients won energy. But inter-note separation improved as well and a rapidly plucked bass seemed simultaneously faster and darker without sacrificing definition. That was clearly way up my alley and much appreciated. I know, you're thinking "Impossible, gimme a break!" I thought the same and rushed back and forth to the bloody mains box swapping out fuses. The fact remains that Nik Bärtsch's Ronin Modul 27 had more rebound and seemed faster while also less bright when the fuses were installed. I'm clueless as to why but there it was. The component fuses pointed in the same direction, effects greater on the amp than source. Here too all sonic aspects advanced a tick and the composite performance became more authentic and fresher. 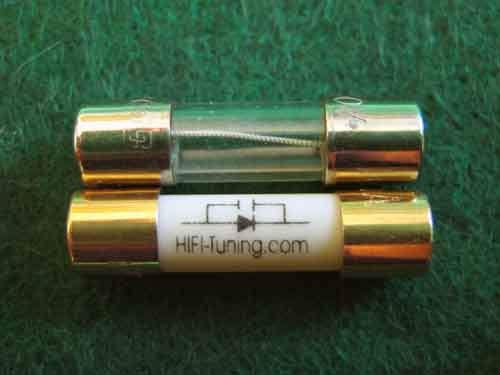 The pure silver fuses by Herr Ahne, the man behind HiFi Tuning, are pretty trick little sticks: To improve resonant behavior, the body is ceramic rather than glass. The end caps are silver layered with copper and gold, the intermediate copper purportedly preventing interactions between silver and gold. The actual wire is raw silver even for the slo-blow variants (they are usually silver clad at best), a world exclusive according to a proud Herr Ahne. make sand ideal, a resonance specialist was called in who initially added micro glass spheres which turned out to be a production nightmare. This gave eventual way to dressing the silver lead in a Polyoelefin tube whereby future Ultimate fuses will wear a mini jacket inside. Which brings us to the Noise Destroyer, a parallel filter said to shunt HF distortion in the AC wiring without dulling dynamics. 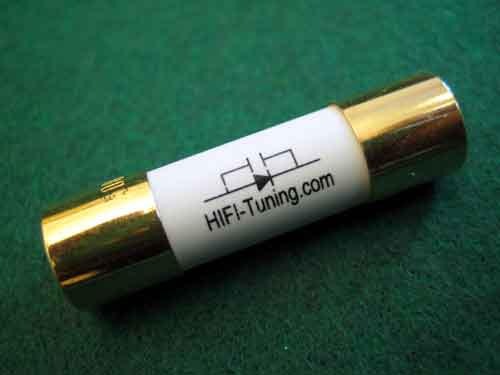 HiFi Tuning recommends that the first filter be installed directly at your electrical counter where the majority of distortions will be handily addressed. 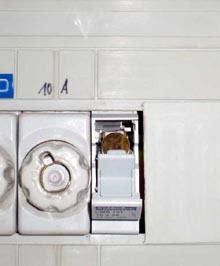 Subsequent filters may not be necessary, otherwise additional ones can be employed on an outlet multiplier or adjacent to a noise source. 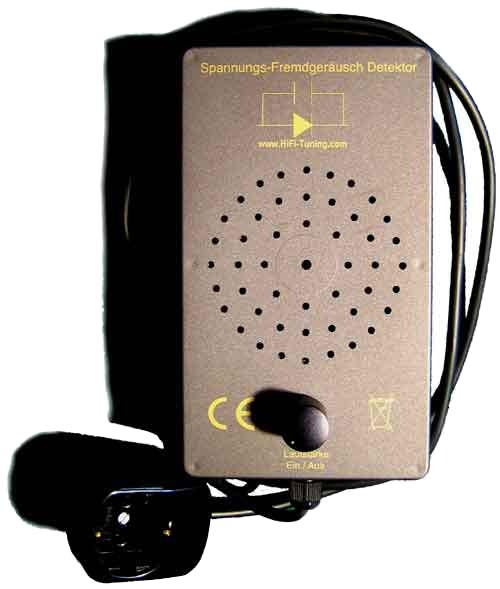 To identify such sources, HiFi Tuning developed the Noise Detector, a gizmo which modulates the noise to make it audible as hum or surf. Once a noise fiend is pinned, there are two solutions: Out of the chain or, in parallel, in with the killer. This is so effective that I cried foul at first: Detector into the outlet multiplier, gain cranked - terrible noise. Killer inserted, silence. "No way," thought I. This game had to be rigged like a bad Carnival stand. 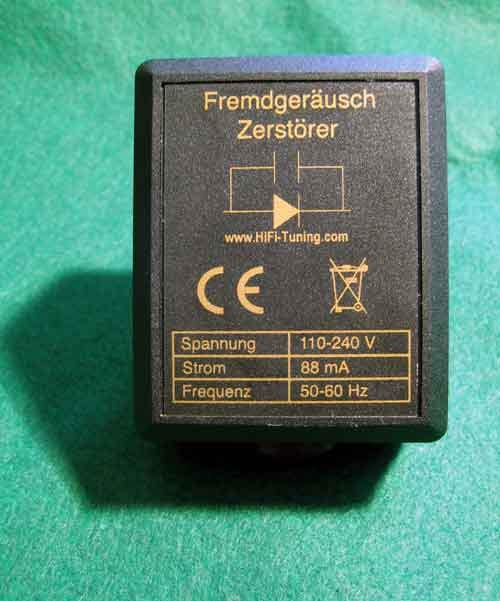 What does the little black box sound like? It doesn't, at least not in a dynamically detrimental way. Dynamics are as they were before, no less, no more. But something's up: The background is calmer and blacker, enhancing the contrast of individual sounds. There's less grating, less nervousness on strings, less outline blur on instruments. Sounds become more dimensionally tactile. Beyond improved 3D-ness, the depth perception increases and virtual space grows backwards. system. My colleague Jörg didn't experience improved depth but his more tacit dimensionality was similar to mine, with sounds better differentiated, less clumped together. Again: borrow, experiment - and buy, perhaps. As for me, these are keepers. Out with the old calculator: The mains fuse including mount is €36, add five component fuses for source and amplification and another €80. The noise killer clocks in at €99 for a grand total of €215. What else would net such improvements for so modest a sum? A good speaker cable? Perhaps but depending on your rig, this might barely buy you a mono lead. Room acoustics? More gains for sure but two close-out corner traps won't get you far - and more money you haven't got to spend. Hmm, I come up short on options. 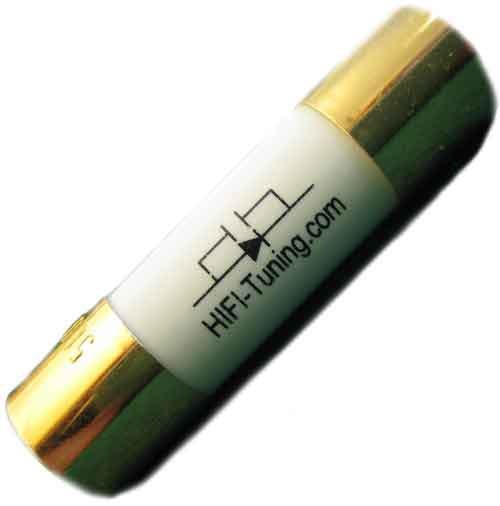 Considering the sonic improvements, the money HiFi Tuning charges for its products (especially the fuses) seems more than fair, even cheap considering certain criminal crap which litters this sector.